I have a database that currently has three tables: one with student demographic data, one for homerooms, and one for grades in various areas per instructional period. Individual student information entry and running reports work without issues. However, what I am really looking for is a way to display the entire class and enter data while instruction is progressing. To use a query to pull the names of those in the current section, have their names and seat displayed down the left side, and then be able to enter assessment data as I walk around with my tablet, teaching. If it is not possible, no problem. If it is, or could be done in a slightly different fashion, I would sincerely appreciate a point (or two) in the right direction. 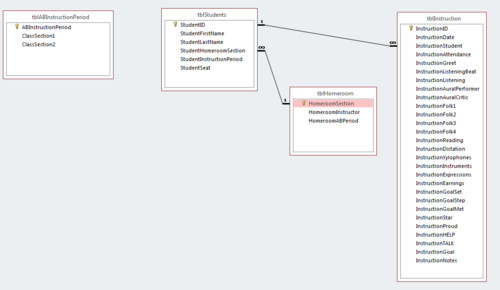 I have included a screenshot of the tables/relationships and one from a continuous form idea that I had been working through, until I realized it wouldn't work in the manner I was looking for. Thank you for taking the time to read my question! I think you need another table "StudentSection" with a PK of StudentSectionID and change the StudentSection in TblStudents to StudentSectionID, with appropriate relationships. That way you can have a main form to select the Section, and a continuous subform showing the students, seats and assessment for that section. I suspect that you may have a problem with the physical width of a tablet and the number of fields you want to display in the subform. There appear to be about 20 short fields (say 6mm wide) + 3 wide fields for name, goal & notes. The labels for the various tasks can of course be vertical. Thank you NeoPa for making the images view-able. but I don't have a table for the actual periods that are taught. The StudentSection is (displayed in the attached image) a designation provided by the district and teachers are assigned at a later date. I am able to obtain the student ID, Name, and Section assignment in a report that can be downloaded as an excel spreadsheet; and then import the data. 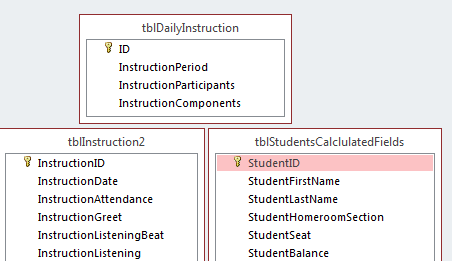 The tblHomeroom uses the unique section numbers assigned by the school system as the PK and has a field for the instructor's name, so that I can use the information in reports. I can also make a simple change, if a instructor is reassigned. The final field holds the period that section/homeroom attends my classroom. I also renamed the StudentSection to StudentHomeroom, because the intent behind it was the district assigned designation and instructor, not my teaching section. Unfortunately, my inexperience with multiple tables and relationships is definitely showing. Despite two hours of tinkering, I am now at the point of posting again and then reviewing the instructional videos to help me over this hurdle. I can't seem to figure out the correct/appropriate place to add the ABPeriod information into the big picture. Thanks again for your time and any assistance that may be offered! P.S. I did try to make the picture view-able based on the code that NeoPa had used, but then the system told me that I was marked as spam. I figured out the relationship in the big picture. Now based on how that work. 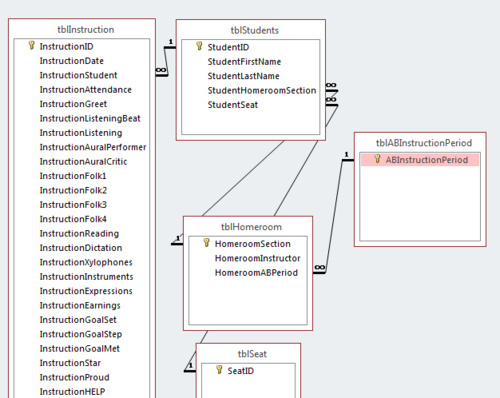 I need to move the student seat out of the student table - it isn't data that is initially added. Thanks again for the pointer - I'll be back to mark best answer, once I am sure I make it to the display in form step. Unfortunately, I don't seem to have the skill (yet) to take the generated list of students for a period and use that information with the tblInstruction on a form. Difficult to see your relationship layout. While I applaud showing the tables in full, bearing in mind the limitations of showing pictures on this website, it helps to keep the "white space" to a minimum and hence the field names etc to a maximum. Your first image is absolutely fine. Normalisation is essential and a brief outline is that many base table should contain information about a single subject. So with your student table, names are fine. I am unfamiliar with the term HomeRoom, so I make no comment, but unless the Student has his own permanent seat, that almost certainly is not in the right table. Now it appears that you give a number of lessons in subjects such as Folk 1,2 & 3, Xylophone etc. Not sure what the other items in your table are, but does every student get marked on every item in the TblInstruction. Sorry, had to use ~ to get the spacing to look right. Your forms would filter only for the date required. If you use the [CODE] tags and spaces (No Tabs) then tables will look fine on here. Homeroom = the classroom where the student receives the bulk of the day's instruction (other than the hour they are P.E. or Music). The students do have unique/permanent seats. tblInstruction (w/ folk1, xylophones, etc) is the collection of areas that are addressed during the hour and that all students are evaluated on. Most are combo boxes (5, 4, 3, 2, 1) and a half dozen (i.e. attendance) are Yes/No check boxes. Folk1 and company are my designations for the typical 4 songs that are used in a lesson. I believe one of my problems is that the student data is there, but the grades would be entered at the time of instruction; so, tblInstruction is empty. 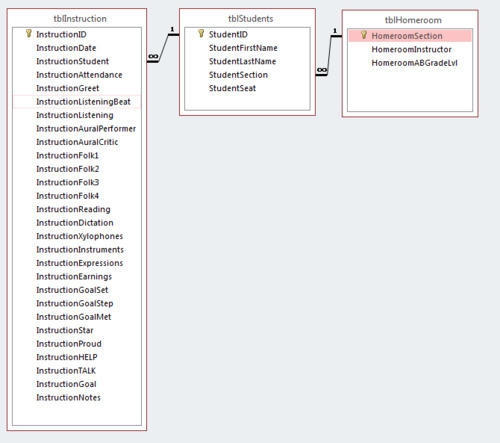 I'm not sure that it is possible to pull the students per period and have empty Instruction fields beside them. The last idea I tinkered with is having tblDailyInstruction in linked with tblInstruction, tblStudents, tblABInstrustionalPeriod but was not successful. All the examples I have encountered are customer related, a store or a library - which work with a single record of entry periodically through the day; a bit different that evaluating 40+ students in many areas in an hour. Additional ideas that I played with. Sorry for the delay in replying - the sun was warm, the breeze was gentle, and messing about on boats seemed a damn sight better option than pounding away on a computer. Your problem is more complex than I thought, but I have some ideas. As you have partially got your Db working, it would be most helpful if you could send that to me (Private Message) and obviously scramble the student's names if you feel the data is sensitive.